In gas metal arc welding of mild steel and 490N/mm2 high strength steel Ar/CO2 mixtures are often used for gas shielding besides CO2. The choice of shielding gas varies country by country and user by user. In Europe Ar/CO2 mixtures are more popular, whereas in Japan CO2 is the favorite. Machinery fabricators often use Ar/CO2 mixtures, whereas steel structure fabricators prefer CO2. The rest of this article discusses the characteristics of Ar/CO2-mixture shielding in comparison with CO2 shielding. The most important useful characteristic of Ar/CO2-mixtures, typically 80%Ar+20%CO2, is their unique molten metal transfer mechanism. 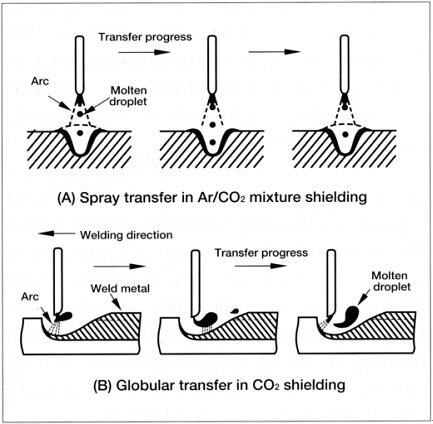 The Ar/CO2-mixture shielding allows the molten metal transfer to occur through "spray transfer" at high welding currents. With CO2 shielding, on the other hand, molten metal transfer at high welding currents occurs through "globular transfer" in the case of solid wires. Fig. 1 shows the difference between the two. Fig. 1 — A comparison between Ar/CO2 mixtures and CO2 on the molten metal transfer mode in gas metal arc welding with solid wires. Fig. 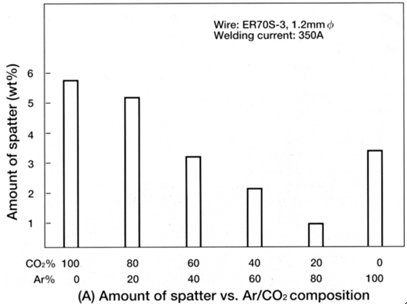 2 — Effects of Ar/CO2 composition on amount of spatter and deposition efficiency of solid wires. metal transfer also depends, on any scale, on the characteristics of cored fluxes, though Ar/CO2-mixture shielding provides smoother molten metal transfer through "spray transfer." 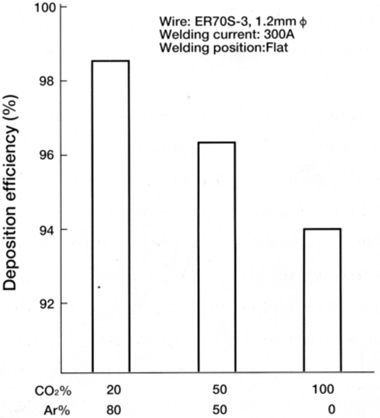 Ar/CO2-mixture shielding, however, causes a lower duty cycle of the welding torch because of more arc radiation heat than CO2 shielding. And Ar/CO2-mixtures may be more expensive.